“I was determined to send out a clear message of change, interpreting the current trend for mixing genres and juxtaposing items in different price brackets,” said Armani. 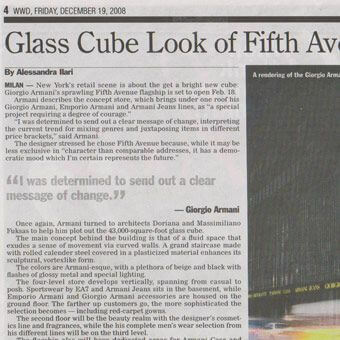 Once again, Armani turned to architects Doriana and Massimiliano Fuksas to help him plot out the 43,000 square-foot glass cube. The main concept behind the building is that of a fluid space that exudes a sense of movement via curved walls. A grand staircase made with rolled calendar steel covered in plasticized material enhances its sculptural, vortex –like form. The colors are Armani-esque, with a plethora of beige and black with flashes of glossy metal and special lighting. The four-level store develops vertically, spanning from casual to posh. Sportswear by EA7 and Armani Jeans sits in the basement, while Emporio Armani and Giorgio Armani accessories are housed on the ground floor. The farther up customers go, the more sophisticated the selection becomes – including red carpet gowns. The second floor will be the beauty realm with the designer’s cosmetics line and fragrances, while the his complete men’s wear selection from his different lines will be on the third level. The flagship will also have dedicated areas for Armani Casa and Armani Dolci, plus a restaurant and bar on the top floor overlooking Central Park. The designer has created special capsule collections of accessories and clothes for the store for both Giorgio Armani, which are limited edition pieces, and Emporio Armani, with exclude Armani/5th Avenue tags.